The TimeCutter® SS3225 zero turn mower features a 32″ mowing deck which is perfect for yards with a lot of trees and landscaping to mow around. It also has Smart Speed™ Control System - giving you greater control of speed and maneuverability. With the flip of a lever, you can change ground speed range from high to low without changing engine or blade speed. Not C.A.R.B. Certified. Toro 452cc Engine- The Toro 452cc engine provides dependable performance and reliable starting with full pressure lubrication and spin-on oil filter. Heavy-Duty Rear Engine Guard- This heavy-duty steel guard protects the engine from branches and debris as you maneuver around your lawn. 3-Gallon Fuel Capacity- All TimeCutter riding mowers feature a large 3-gallon (11.4 Liter) fuel tank for more mowing with fewer fill-ups. Knowing when to fill up is simple thanks to the translucent tank, which also helps to prevent overfilling. 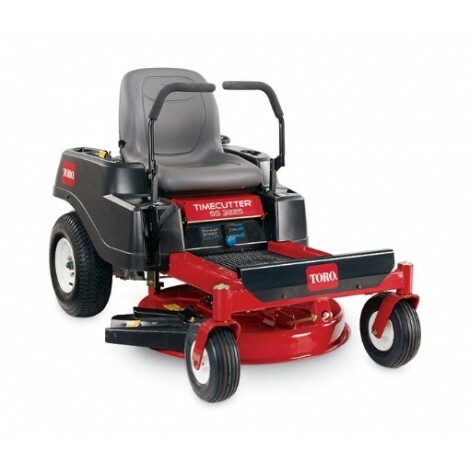 32" Mowing Deck- Toro's four inch (10 cm) deep, top discharge deck design provides superior cutting performance in all conditions. Create your own natural fertilizer by adding a Recycling Kit® or make yard clean-up a snap with an optional Twin Bagging system. Washout Ports- Deck washout ports create a pressure washer under your deck providing quick cleaning, maintaining optimum airflow for optimum cutting performance. 50" (127 cm) deck is pictured. Hitch Kit Standard- Hitch kit comes standard on all TimeCutter models. It's easy to increase the versatility of your zero turn mower by attaching a dump cart, de-thatcher, fertilizer spreader or other Brinly-Hardy attachments. (Attachments sold separately.) See all attachments. Anti-Vibration Floor Mat- This rubber floor mat is a great addition to your TimeCutter zero turn mower. Reduces vibration and dampens deck noise during mowing. Dual Hydrostatic Drive System- Independent hydrostatic drive systems provide responsive maneuverability and zero turning capabilities. These independent drives are anchored to Toro's unibody frame and reinforced with a cross member for lasting durability and performance. Heavy-Duty 10 Gauge Uni-body Steel Frame- The lower the gauge, the thicker the metal, that is why we use heavy duty 10 gauge steel. The uni-body steel frame provides the optimal balance in rigidity and flexibility for quick, highly maneuverable mowing conditions. Non-Slip, Easy-to-Clean Floor Pan- The pierced floor pan is perfect for homeowners who like their mower to look as nice as their lawn. Simply hose down the floor pan after each use and keep your TimeCutter looking as good as new. The non-slip pierced extrusions also provide an additional measure of safety. 18" Extra Tall Seat- When you're mowing for an extended period, there's no substitute for a good seat. The 18” extra tall seat offers permium support during longer mowing sessions. 3-Year Limited Warranty - No Hour Limitations- Product is warranted against defects in materials and workmanship for three years without an hour limitation. See owner’s manual for complete warranty details.